How to live with dinosaurs! 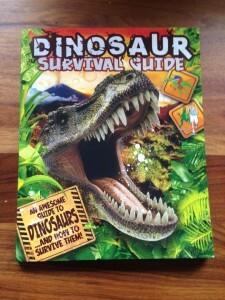 Dinosaur Survival Guide was published by Arcturus on 15 March. It’s written by Nibwebber Clare Hibbert and designed by her Hollow Pond partner Amy McSimpson. It’s a mash-up of dinosaurs and Bear Grylls-style survival skills – basically 128 pages of what you should do in the unlikely and anachronistic event of being stranded in dinosaur times!